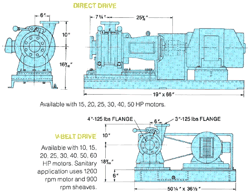 It sizes, reduces, disperses, separates, delumps, grinds, chops, macerates ... and it even pumps. 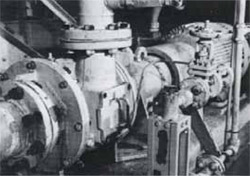 The Gorator works on a simple inclined rotor principle, which gives the machine its self-cleaning, non-clog, trouble-free characteristics under the most difficult conditions, with a rotor at an oblique angle on the end of the pump shaft. 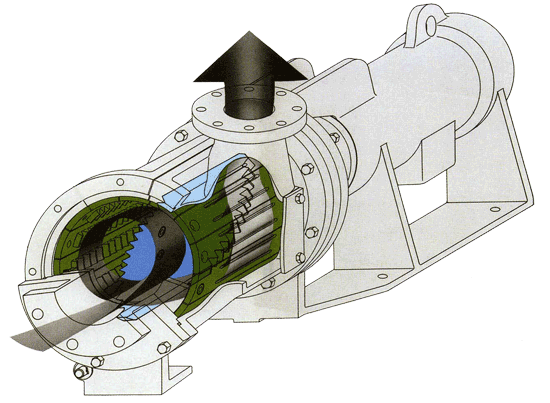 Rotation of the impeller produces a centrifugal action which pumps the material and discharges it radially through the outlet. 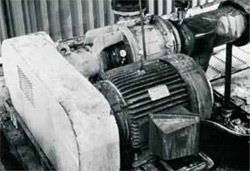 Notched teeth in the rotor plate mesh with teeth in peripheral stator bars to chop the material during its passage through the pump. Mixing and dispersion intensity can be readily controlled by the user, and the Gorator can run dry or partially dry without risk of damage so long as the seal area is flushed. The Gorator can be adapted to meet a wide variety of needs in an ever-increasing number of industries. It is easily fitted to meet individual reducing needs by spacing the liner bars to exactly the position required for various size particulates. Synthetic fibers, sludges, slurries, high-density pulps, rubber dispersions, slaughter-house residue, high-viscosity materials, chemical residue, industrial waste and paper stocks are but a few of the materials being successfully handled by the Gorator. 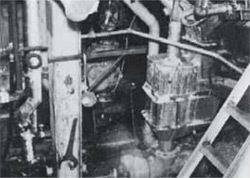 Material enters the front of the pump, is macerated between the rotor plate and the liner bars, and exits at the top of the pump. Particulate sizing is easily set by adjusting the spacing of the liner bars. This rugged processing machine solves many problems in pulp and paper mills. 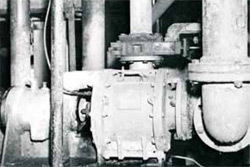 The Gorator prevents plugging of black liquor guns in recovery boiler systems. It breaks up ground wood bull-screen rejects. It has proven very effective in dispersing wet-strength secondary fiber. 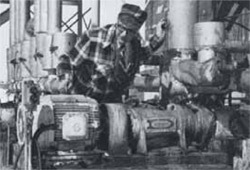 And because the Gorator is so efficient in breaking, deflaking and fiberizing, it gives mills 50% more production out of pulpers, reducing total required horsepower-days per ton. It’s also economical for small peripheral repulping systems. The meshing of rotor plate and stator teeth makes for a very efficient shearing action, but a running clearance for 1/16th" allows the Gorator to fiberize, deflake, and shred without cutting fibers. In one application in the pulp and paper industry, the Gorator is being used in pulp mill effluent dewatering to disintegrate sedimentation tank underflow sludge prior to dewatering by centrifuge. In pulp mill effluent skimming, it disintegrates floating chips, bark and other debris prior to their combining with underflow sludge. And in another application, mechanical pulp manufacturing, the Gorator disintegrates bull-screen rejects prior to pumping to the waste lagoon. A variety of industries find the Gorator useful in processing industrial wastewater. It is being used by chemical and petrochemical plants to disintegrate liquid waste prior to incineration. Waste is recycled around hot and cold tar holding tanks to protect feed pumps and incinerator nozzles. The Gorator sizes, shreds and pumps plastics, rubber and adhesives. The mighty Gorator is several machines in one. It saves time, space and money for quicker payback on initial investment for companies in the CPI who are using it in many ways. The Gorator controls particle size to prevent clogging of lines in polymerization and crystallization trains, providing hazard free screening and uninterrupted production. It disperses polymers and rubber in solvent. It separates such materials as agglomerated polymer pellets. It is used in the extraction process from plant stocks in pharmaceutical manufacture. 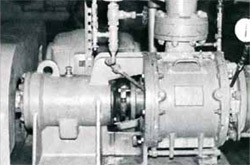 It disintegrates wastes to prevent nozzles and valves from clogging. And it handles a host of other size reduction, shredding, extraction, separation and disintegration chores. The Gorator eats up the challenges of size reduction and dispersion. It can be used for a variety of heavy-duty macerating jobs in food processing plants – disintegrating, shredding and controlled sized reduction. It is being used successfully in such applications as fish wastes, citrus peels, secondary vegetable products (for reducing the volume prior to disposal), tomato processing and for grinding bones, fat and gristle for rendering. Moreover, the Gorator has been built to stand up to, and survive, the heavy stresses induced by the shearing action. The Gorator is also used for wastewater processing in the food industries to grind spent hops in brewing. click for details The 6X4X10 Gorator is designed for maximum flow and controlled size reduction, complete mixing, stripping, dispersion or delumping in industrial applications. click for details The 6X4X10V Vertical Gorator is built in a vertical configuration to macerate chunky materials that do not flow easily. 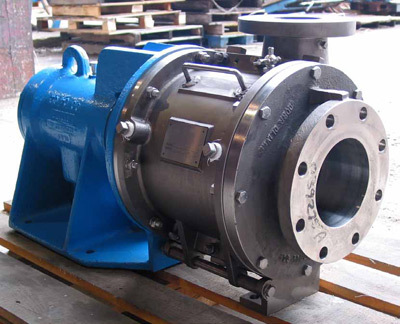 It may also be connected directly to the bottom of a mixing vessel to accelerate mixing, dispersion and extraction due to the vortex action of the impeller. click for details The 4X3X8 Gorator was designed specifically for tough sludge screening and scum and sludge disintegration service in sewage treatment plants, or lower flow rates in industrial applications. 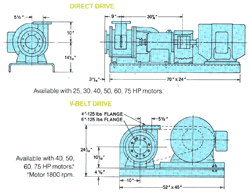 It is the most cost-effective unit of its type on the market. click for details The 4X4PP Gorator is a non-clogging, angled rotor pump ideally suited for pumping grit. It is designed for high-viscosity slurries containing large quantities of debris.